In the modern era, we are very conscious of the impact of humanity on nature — even though we are often very reluctant to do anything about it. Whether it be the problem of human encroachment on the territory of endangered species, the threat of global warming on the ecology of a region, or the effect that new technology (such as wind power) can have on native flora and fauna, we can have an impact on nature in sometimes surprising ways. We have had a significant influence on the natural world since even before recorded history, but it is only very recently that we became aware of this. Looking back through old scientific journals, one can find examples where new technological developments have brought about an unexpected response from nature. One such example is a short letter published in Science in 1887, which I reproduce in its entirety below. Some disadvantage or evil appears to be attendant upon every invention, and the electric light is not an exception in this respect. In this city they have been placed in positions with a view of illuminating the buildings, notably the treasury, and a fine and striking effect is produced. At the same time, a species of spider has discovered that game is plentiful in their vicinity, and that he can ply his craft both day and night. In consequence, their webs are so thick and numerous that portions of the architectural ornamentation are no longer visible, and when torn down by the wind, or when they fall from decay, the refuse gives a dingy and dirty appearance to every thing it comes in contact with. Not only this, but these adventurers take possession of the portion of the ceiling of any room which receives the illumination. It would be of interest to know whether this spider is confined to a certain latitude, and at what seasons of the year or temperature we can indulge in our illumination. 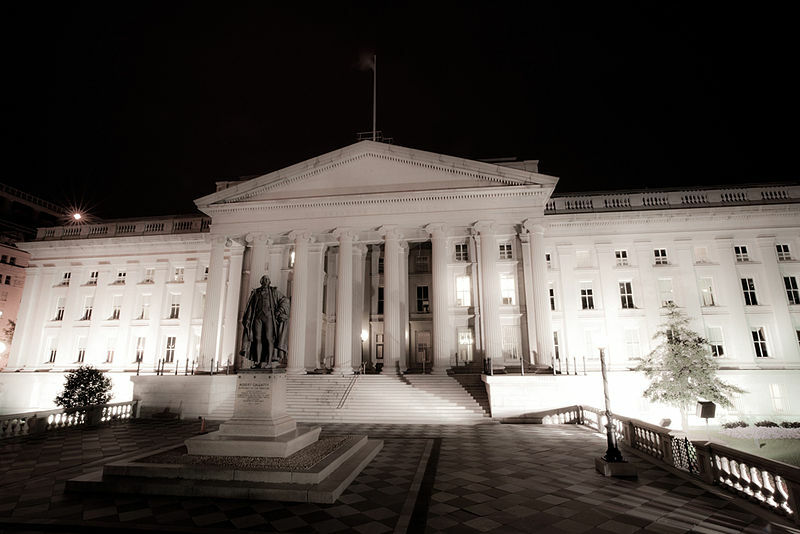 In short: electric lighting was introduced to illuminate buildings such as the U.S. Treasury, pictured below, and of course moths and other insects were drawn to the bright lights. Enterprising spiders (“adventurers”) immediately seized the opportunity to build their webs over the light fixtures, bringing in a bounty of food for them. These webs, however, end up blocking the light and obscuring its target! The Treasury Building, via Wikipedia. Obviously this problem has been solved in modern times, possibly in part because everything is illuminated these days. It is rather interesting to see such an early example of the adage, “Every new technology introduces new problems”. G. Thompson, “Spiders and the electric light,” Science 9 (1887), 92. This entry was posted in ... the Hell?, Animals, History of science. Bookmark the permalink.